On Saturday October 18th in Girona, Spain the All Star team of Catalonia took on Team Holland also known as the Dutch Lions. In a game were many assumed the Lions should dominate, Catalonia had many key players from Team Spain. Head coach Xus Fernandez from the Badalona Dracs brought along his quarterback Sergi Gonzalo and also another one of Spain’s top quarterbacks Ramon Figueroa from the Pioners. But head coach Winston Ronde and defensive coordinator Steve Sheppard have put together a talented lion squad that know each other well. 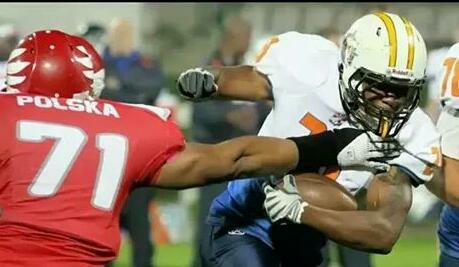 Quaterback Richard Bouthoorn from the Dutch champs Alphen Eagles has started every game for Holland since 2012. In the backfield to complement Richard is Eagles teammate running back Chris Smith who is a threat catching out of the backfield and was a dominating factor in the Czech game. The ball players they had wasnt our biggest problem. Their were times we shot ourselves in the foot by making some mistakes. It was a great game all around, but it wasnt easy. We had to pull through and show discipline on both offense and defence troughout the whole game. Luckily thats exactly what we did so we could get the win. I felt great running the ball and the o line did a great job at creating gaps I could run through. I felt satisfied with my game play by being able to bring the offense in scoring position so the recievers could end the drives with touchdowns. 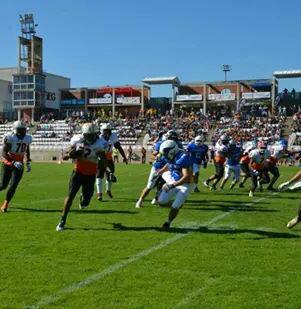 The National team will keep on building and making preperations for the European cup and i’m thinking bout playing for a team in the GFL or elsewhere in Europe this 2015 Chris last stated. Smith and the Lions took home a 36-26 win over Catalonia in their 25th anniversary celebration game. We would like to wish Chris and his team’s the best in 2015! This entry was posted on October 19, 2014 by Jamaal Jonas. It was filed under Sports and was tagged with catalonia, Chris Smith, Dutch lions, team holland, team spain.